Discussion in 'Made with GameMaker' started by True Valhalla, Feb 11, 2019. Pet Round Up - Dozens of adorable pets have escaped and it’s your job to round them up! 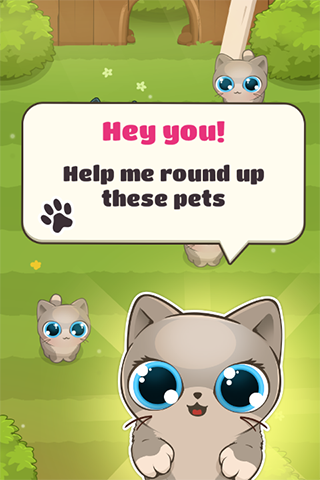 Capture mischievous kittens and puppies before they go into hiding. This game is part of a series of experimental high definition games that I'm producing; my goal with this series is to test the limits of what I can achieve with HTML5 technology, and to produce content with a longer lifespan in the licensing market. Feedback regarding the design, gameplay, and performance is very welcome. Have fun! Ahahahhahahaha! This is TOO CUTE! Very nice game. Lots of fun to play, with an easy mechanic, a perfect bite-size gameplay loop, and very, very cute graphics (sound is cool too, all appropriate and nothing annoying). My ONE complaint? You can't change where you play without refreshing the page. I figured that from the Pause menu or Game Over screen you could go back to the play menu and select the Yard instead of the bedroom, but nope. You have to refresh the page, which is mildly annoying. True Valhalla and sitebender like this. Cute game. Well made and designed.